TULARE COUNTY – Kayla Barnes went ballistic after winning the Tulare County Spelling Championship last Wednesday. Okay, so maybe Barnes didn’t have an uncontrollable outburst of emotion, but the seventh grader from George McCann School in Visalia certainly spelled the word correctly, b-a-l-l-i-s-t-i-c, to take the county crown. 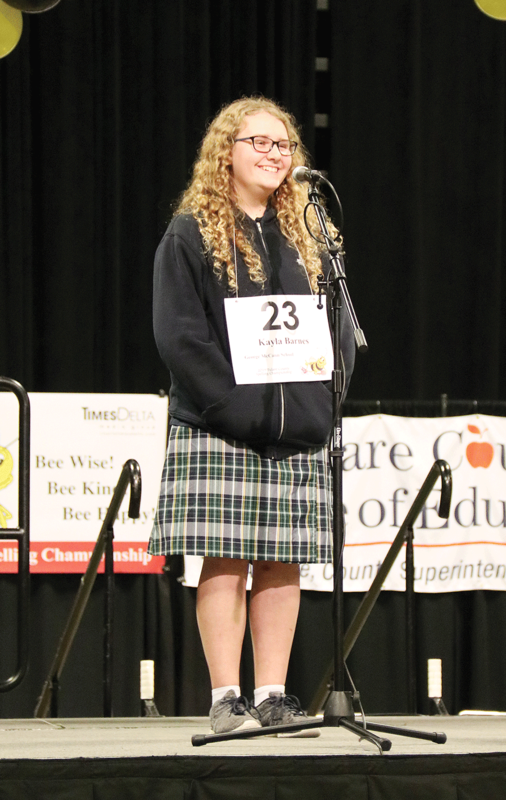 Kayla Barnes, a seventh grader at George McCann School in Visalia, beat out 227 spellers for the Tulare County Spelling Championship on Feb. 20 at the Visalia Convention Center. Photo courtesy of the Tulare County Office of Education. Barnes spelled the word in the eighth round of the five-hour competition on Feb. 20 at the Visalia Convention Center. Barnes words in each of the rounds were: Round 1 – crimp; Round 2 – broach; Round 3 – famished; Round 4 – minify; Round 5 – authoritarianism; Round 6 – majordomo; and Round 7 – plumeria, a fragrant, flowering tropical tree. The second place winner was Manroop Turna, an eighth-grade student at Woodlake Valley Middle School in Woodlake. There was a six-way tie for third place, including: Trey Amundson, seventh grade, Cherry Avenue Middle School, Tulare; J.T. Amaral, seventh grade, Sequoia Union School, Lemon Cove; Juliet Prosser, seventh grade, Green Acres Middle School, Visalia; Luis Mendoza, seventh grade, Carl F. Smith Middle School, Terra Bella; Mikhael Duquette, sixth grade, Cottonwood Creek Elementary School, Visalia; Arlyn Pagtama, eighth grade, Summit Charter Collegiate Academy, Porterville. 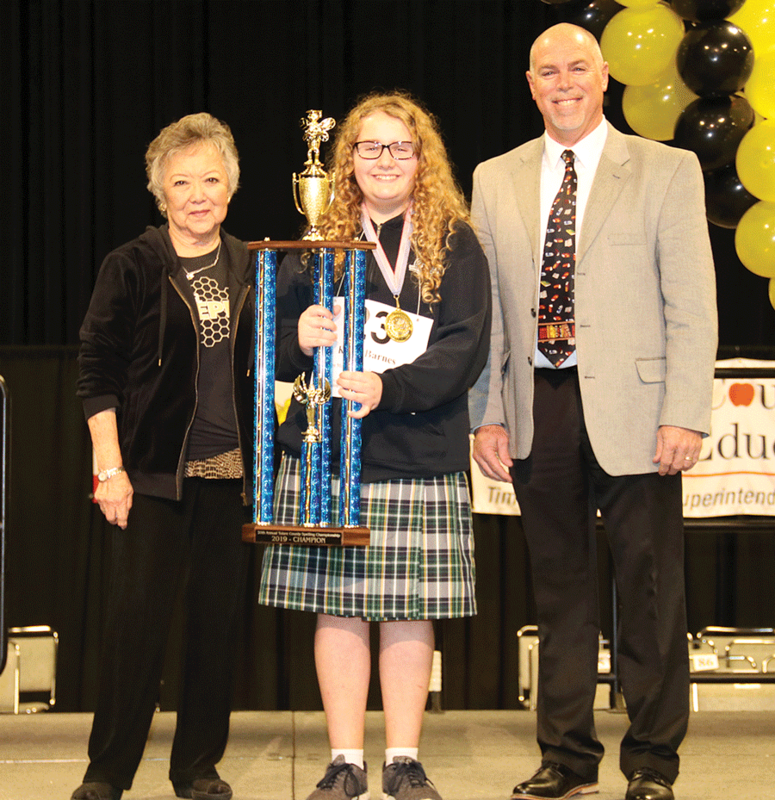 This year, 227 spellers from grades four through eight representing 116 schools competed for the opportunity to become the 2019 Tulare County Spelling Champion. Barnes will now advance to the Scripps National Spelling Bee in the Gaylord National Resort and Convention Center in National Harbor, Maryland, May 27–30, 2019.